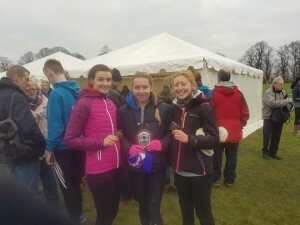 The first weekend (5/1/19) of the year saw this years Staffordshire AAA’s Cross Country Championships, with individual, team and representative honours to be gained. Held at Stafford common on a slightly different course than the league fixture back in November, we had competitors in all the available age groups. In the U/13 Girls and Boys Races we had Lucy Brownsword, Mathilde Wakefield, Beatrice Wakefield, and Harrison Everard, Daniel Jones, Joseph Stevens, Jamie Betteley and Charlie Ranford racing over 1 medium lap and 3.6km. In the Girls Race our first finisher was Bea in 19th (14:55), with Lucy in 22nd (15:19) and Tilde in 26th (16:06), the girls finished in 5th position. In the Boys race Charlie Ranford was first back in 9th (12:57), Jamie was next in 15th (13:35), with Joe in 20th (13:51), Daniel in 25th (14:06) and Harrison in 33rd (16:02). The Boys just missed out on the team medals finishing in 4th position. In the U/15 Girls and Boys Races we had Poppy Ranford, Lily Stevens and Louis Wakefield, racing over 4.8km (1 small and 1 medium lap). In the Girls Race Poppy was our first finisher in 12th position (19:15) with Lily just behind in 18th (20:31). In the Boys Race Louis was challenging at the front of the race from the start and was rewarded with his first County Cross Country Bronze with a fine 3rd position in 16:02. In the U/17 Women, U/17 Men and U/20 Women’s Races we had Scarlett Cotton, Misha Twardochleb, Elizabeth Clarkson, Nadine Tomkinson, Elliot Smith, Thomas Mogg, Lewis Nagington, Lauren Charlton, Grace Ranford, Lucy Matthews,Sophie Goodfellow and Rebecca Twardochleb, who all raced together with the Senior and Masters Women over 2 medium laps over 6.2km. In the U/17 Women’s race Nadine was first back in 5th (21:40), closely followed by Lizzie in 6th (21:53), Misha in 10th (23:07) and Scarlett in 13th (23:55) to secure another great County Team Gold ahead of Wolverhampton and Bilston. In the U/17 Mens Race Lewis had another strong run and claimed individual bronze in 18:08, Thomas was next in 15th (22:53) followed by Elliot in 16th (22:57), and as a Team they claimed County Bronze on the day. In the U/20 Women our 5 ladies dominated the County Championships, all finishing in the first 6 positions and comfortably winning County Gold! Securing victory (and 2nd overall) was Becky in 19:43, Sophie claimed the bronze in 20:54, Lucy was 4th in 21:09, Grace was 5th in 21:29 and Lauren was 6th in 21:54. Our U/20’s were also all part of a great Senior Team performance winning Gold in that event too ahead of local rivals, City of Stoke, Cannock & Stafford, Wolverhampton & Bilston and Trentham, Stone MM, Cheadle, Newcastle Tri Club and Stafford Harriers. The U/20 Men raced in with the Senior and Masters Men over 3 large laps (10km). Our first finisher, just missing out on individual bronze was James Fradley in 4th (30:26), Jordan Nixon was 6th in 31:05 and Jacob Droogmans was 8th in 31:28. Our team of James, Jordan and Jacob claimed a fine Team Silver (missing Gold by just 2 points). Congratulations to everybody that represented the club and especially to our U/17 Women’s team (Gold), U/20 Women’s Team (Gold) and Senior Women’s Team (Gold), U/17 Mens Team (Bronze), U/20 Mens Team (Silver), Louis individual U/15 Boys Bronze, Lewis individual U/17 Boys Bronze and Becky individual U/20 Gold and Individual Senior Silver! A great start to this calendar year by the clubs young athletes.